SALT LAKE CITY -- A second Salt Lake City police officer has been put on paid leave as authorities investigate the use of force in a nurse's arrest. The July 26 incident captured on police body-camera video showed police detective Jeff Payne dragging nurse Alex Wubbels from a hospital and handcuffing her after she refused to allow blood to be drawn from an unconscious patient in a car-crash investigation. The second officer hasn't been identified formally, but officials have said they also were reviewing the conduct of Payne's boss, a lieutenant who reportedly called for the arrest if Wubbels kept interfering. 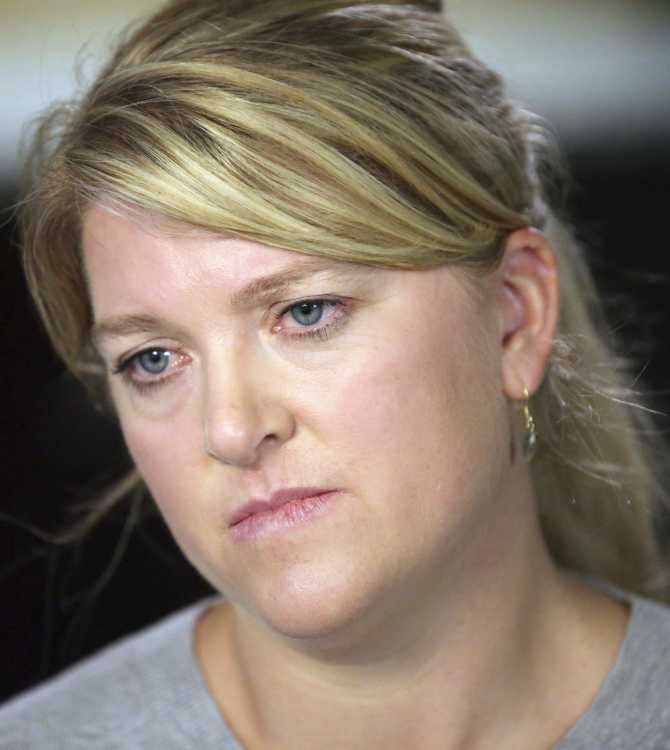 After Wubbels and her attorneys released the video, prosecutors called for a criminal investigation, and Salt Lake City police put the detective on paid leave Friday. "This cop bullied me. He bullied me to the utmost extreme," Wubbels said in an interview. "And nobody stood in his way." The Salt Lake City police chief and mayor also apologized and changed department policies in line with the guidance Wubbels was following during the incident. Wubbels, a former alpine skier who competed in the 1998 and 2002 Winter Olympics, said she adhered to her training and hospital protocols to protect the rights of a patient who could not speak for himself. "You can't just take blood if you don't have a legitimate concern for something to be tested," Wubbels said. "It is the most personal property I think that we can have besides our skin and bones and organs." Payne didn't return messages left at publicly listed phone numbers, and the Salt Lake Police Association union did not respond to messages for comment. The department and a civilian board also are conducting reviews. "I was alarmed by what I saw in the video with our officer," Police Chief Mike Brown said. Police body-camera video shows Wubbels, who works in the burn unit, calmly explaining she could not take blood from a patient who had been injured in a deadly car accident, citing a recent change in law. A 2016 U.S. Supreme Court ruling said a blood sample cannot be taken without patient consent or a warrant. Wubbels told Payne a patient had to allow a blood sample to determine intoxication or be under arrest. Otherwise, she said police needed a warrant. Police did not, but Payne insisted. The dispute ended with Payne saying, "We're done, you're under arrest" and pulling her outside while she screamed and said, "I've done nothing wrong!" He had called his supervisor and discussed the time-sensitive blood draw for over an hour with hospital staff, police spokeswoman Christina Judd said. "It's not an excuse. It definitely doesn't forgive what happened," she said. Payne wrote in a police report he grabbed Wubbels and took her outside to avoid causing a "scene" in the emergency room. He said his boss, a lieutenant whose actions also were being reviewed, told him to arrest Wubbels if she kept interfering. The detective left Wubbels in a hot police car for 20 minutes before realizing that blood had already been drawn as part of treatment, said her lawyer, Karra Porter. Wubbels was not charged. "This has upended her worldview in a way. She just couldn't believe this could happen," Porter said. Salt Lake County District Attorney Sim Gill said that the video was concerning and called the police chief to ask for a criminal investigation. The hospital said it's proud of the way Wubbels handled the situation. The patient was a victim in a car crash, and Payne wanted the blood sample to show he had done nothing wrong, according to the officer's written report. The patient, William Gray, is a reserve police officer in Rigby, Idaho, according to the city's police. They thanked Wubbels for protecting his rights. Gray is a semi-truck driver and was on the road when a pickup truck fleeing from authorities slammed into him and his truck burst into flames, police reports say.